Long ago in a town far, far away, I was an undergraduate student. I had one teacher, professor O’Brien, who insisted that his students communicate with him via email. Back then, I sent and received at most two messages per week. Today, you can put a pair of zeros behind that number. I’m sure I’m not alone. For many, reading emails is more of a chore than a convenience. One thing you can do to make things easier on your recipients is to write clear, uncluttered subject lines. It’s not very difficult, but can go a long way to making this often irksome task more pleasant and efficient. First and foremost, keep your subject lines short. 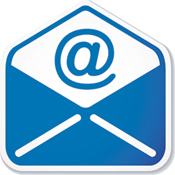 According to Business Insider, most computer-based email applications only show around 60 characters in email subject lines. On smart phones, mail apps show maybe half that number. Full sentences won’t really work to meet those restrictions, so consider key words or ideas. Focus on the heart of what you’re going to say. And, to be clear, “Hey!” is not a worthwhile subject. Since mobile phones give you so little to work with, get the most important words out first (often it’s a verb). “Cancel lunch Friday,” for example, is just 19 characters, the crux of the message, and “cancel” is featured first. With that point made, it’s time for some decluttering. We aren’t shooting for a diagrammable sentence here, so implied words may be sacrificed. This isn’t always a good idea, of course, but if you’re pushing the limit, feel free to jettison an “although” or even an “after,” if you can without changing the meaning. There are a few people I communicate with regularly who have a habit of indicating whether or I not I need to respond in the subject itself. For example, “no response needed” or “please respond.” I don’t like this practice, though I know many do. I think it’s just extra words for me to process, but I also understand that if you’re skimming your inbox, it can help identify which messages need attention and which can be set aside. I’ll leave this one up to you. If your recipient understands the meaning, a message that is completely conveyed in a subject line can be ended with an EOM (end of message). This is good for simple status messages like “Finished (EOM)” and “Meet me in lobby in 5 (EOM).” It saves your reader time by knowing they don’t even have to open the email. If you have more than 25 characters, however, it’s best to keep the subject line brief and put a longer message in the body of an email. Anything longer than that and your reader might have to open the email anyway to see the whole subject line. Finally, I have two pet peeves I want to share with you. Unless you’re aiming to be funny, don’t start a sentence in the subject and then finish it in the body. Typically I din’t know that’s what’s going on, and I read the body as a fragment sentence, which is confusing for a few seconds until I interpret your setup. I’ve seen this work where the subject is the setup and the body is the punchline, but that’s rare. And, this should go without saying, don’t use all caps. Slogging through email is annoying enough; yelling doesn’t help. Sometimes I long for the days when I was sitting in the library at Marywood University, that orange cursor blinking at me while I banged out a simple, three-sentence message to Dr. O’Brien. Two messages per week? I could live with that. For many years, I’ve been unable to eat guacamole at home because I did not own this extremely specialized serving device just for guacamole. For all your 10″ and 11″ round layered cake cutting needs … which, I guess, are few. As you are reading this, I’m at home recuperating from shoulder surgery. As such surgeries go, it was pretty minor, but there was still a reasonable amount of preparation I needed to do. Besides knowing the date of surgery, I had to find out what post-surgery appointments I would have and what physical therapy would be needed. Doctor’s offices often tend to tell you only the next step, but it makes planning easier when you know what’s coming at least for the next month. “So, we’ll see you the Monday after surgery” is not what you want to hear with little notice when your doctor’s office is not nearby, and you need to ask someone for a ride. I also needed to learn what restrictions I would have that would affect my ability to work, socialize, drive, etc. That’s somewhat hard to tell, because everyone heals differently, but getting at least a usual range allowed for some planning. Medical supplies: I got all my post-surgery prescriptions filled, and made sure I had gel packs and packages of frozen peas to ice my shoulder. Clothes: When you can’t raise one arm, it affects what you can wear. I had to buy shirts that button rather than go on over my head. Food: I stocked up on the easy-to-digest items I need post-surgery. Also, since cooking will be a challenge for a while, I got some frozen dinners. And I determined which restaurants in my area do home delivery. Utensils: I don’t have a dishwasher, and doing the dishes by hand might be difficult for a week or two. So I brought in the paper plates and plastic silverware I had stashed away in the garage. Heavy items: I bought a large bag of cat food and emptied it into the kitty food storage container. The food comes in a heavy bag, and I usually use two hands when I’m going to refill. That could be awkward for a while after surgery. Since I already had my estate documents done, including a medical power of attorney, the only thing I had to do was bring that power of attorney document with me on the day of surgery. As someone who lives alone, this is a big deal for me — but even those living with someone may need help from others. I knew someone had to drive me to surgery and back, and someone had to stay with me for a while after I came home from surgery later that day. I’m lucky enough to have family members who live in the area (and some helpful neighbors) who could take care of that for me. But beyond that, I have a list of people I can call on for any other help I may need. I know I’ll need a few rides, but I imagine there will be other things I’ll need that I haven’t thought of, even with all my preparation. Having that list of people who are more than willing to help out means I’ll never need to worry about getting whatever assistance I may need. Okay, I’ll admit, there is something adorable about a gallon of milk rocking away the hours in the refrigerator. I imagine it would take up knitting and ask me to keep quiet during its stories. 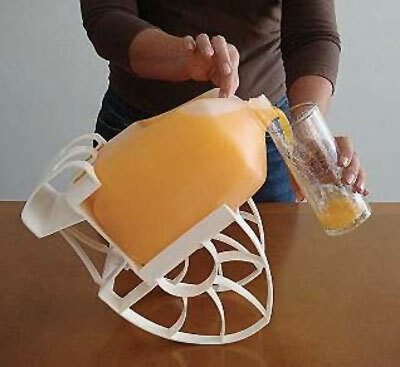 But, for the itty bitty amount of help it might give someone with pouring, those benefits would quickly be erased by the amount of storage space you’d have to sacrifice in your refrigerator and in the process of having to carry it in and out of the refrigerator every time you wanted a drink. If handling large gallon containers is an issue for you or your family, do what we do and simply buy smaller, easier to carry and pour containers (which you’re likely already doing). Or, buy the larger container and have or provide assistance in pouring some of its contents into a more manageable small carafe. If handling gallon containers isn’t an issue for you or anyone in your family, this device is just downright ridiculous. I think we can chalk the Roll N Pour’s unitasker status up to over-engineering that intended to be helpful, but isn’t. Organizing. Straightening up. Cleaning. Tidying. Arranging. These are some of the terms that describe varying levels of what everyone who has possessions does to keep their dwellings from being messy. By their very nature, each term’s definition can vary greatly from person to person, spouse to spouse, or house mate to house mate. In the name of domestic harmony and effective un-messying, I’m opening a dialog on how we define these terms and what we expect from each. A similar conversation like this in your home can ensure everyone is on the same page when talking about establishing and maintaining order. It doesn’t matter if your terms match mine, simply that all of you agree on the definitions of the words and phrases you use. For me, organizing is to apply logical structure to an unstructured collection of items. The items can be physical, like books or LEGO bricks, but they also can be intangible, like ideas or plans. If I were to organize something, you can expect to see a collection of items arranged in a neat, systematic order. In other words, a messy pile of [x] becomes a tidy arrangement, sorted by a system that is easily understood. Straightening up is different from organizing in that it implies that organizing has already been done, and only some minor maintenance is needed to restore order. My kids’ shoes are stored in three wicker baskets near the back door of our house. Three baskets for three kids. The organizing has been done — having baskets for each kids’ shoes. To straighten them up, I’d ask the kids to put their shoes in their basket. Cleaning implies no organizing or straightening up. For me, cleaning means simply: to bust out the window cleaner, mop, broom, vacuum or what-have-you to remove dirt, dust, and the like. I’ll admit it, I don’t like cleaning. It’s the most labor-intensive of the activities, and involves taking things down, moving furniture, and telling the kids, “Stay off the floors!” We can get nit-picky and differentiate between “cleaning” and “a good clean,” but that’s for another conversation. There are even more words in the English language to discuss un-messying your home. Tidying is one that implies the least amount of effort of the bunch. If I’m going to “quickly put these things in to some semblance of order before our dinner guests arrive,” I’ll spend likely less than 10 minutes resetting order. If your home is organized and you take time each evening to straighten up before bed, tidying is usually all you need to do when you have people over to visit. Now I turn to you, readers. How to do define these un-messying words? What do you expect of each, and, finally, are there any terms specific to your household? I once had a friend from the midwest who said, “This room needs ‘red’ up.” I think that meant cleaning up. Slow and steady wins the race. Clear one small space at a time. Organize just one drawer or one shelf per day. Think about looking at the empty spots and making them bigger. Working for just five or 10 minutes a day will help clear the clutter. Walk around a room with a trash bag. Put everything you see that is trash into the bag. Place the bag by the door and take it out the next time you go. Repeat this task with a bag for items you wish to donate to charity. A detour does not mean you’re losing! There will be setbacks. You may have a day where you’re just too tired or ill to unclutter. Don’t let it stop you — just start again as soon as possible. Done is better than perfect. It is okay to make mistakes. It is okay for your uncluttering and organizing efforts to be not quite right. Keep the overall goal in mind and you’ll make it to the finish line. Think (but not too much). 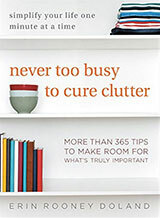 If you’re making long, complicated decisions about each item, you’ll never finish uncluttering. Don’t spend more than a few minutes on any particular item. Ask for help if you need to. Just because you can think of many ways to use an item, does not mean you have to keep it or that you will ever use the item in all the ways you imagined. If you haven’t used the object in a year or haven’t even seen it in ages, you can probably live without it. Take a risk. The people who gain the most are usually the people who are willing to risk the most. Play a game with yourself by asking, “What’s the worst that can happen if I throw this out? And how bad would that really be?” Chances are, the worst is not as bad as you think. Make it easy. It may seem like a simple idea, but having the trash can or garbage bag easily accessible makes it easy to get rid of trash. Rather than putting garbage down just anywhere, put it in a trash bag. If you need to, put a trashcan, recycle bin, and donation basket in every room. It may take a little longer to collect up the trash bags on garbage day, but each room will be cleaner. Sort before discarding. By grouping similar items together as you work, you speed up the organizing process. It is hard to get rid of one white shirt but it is a bit easier to get rid of 18 of the 20 white shirts. Grand Prix! Give yourself a prize each time you’ve successfully reached a goal. Vow to give yourself a treat such as a special dessert or an evening at the movies if you’ve uncluttered 20 minutes per day for a whole week. At $160, this Elegant Baby Cup signals to all the other babies that your baby knows how to live it up and fine dine with the mucky muck. Even though your baby can’t hold up its head or find its mouth with regular consistency, pay no mind. While this attempted multitasking would usually just make us less efficient, sometimes it can be downright dangerous. The dangers of texting while driving are self-evident, since taking our eyes off the road can’t be a good thing. One study showed that the crash risk when texting was 23 times greater than when not texting. (Another study reported a less drastic figure, with an eight times greater crash risk, but that’s still very high.) Drivers who texted had their eyes off the road for an average of 5 seconds, which is long enough to go the length of a football field for someone driving at 55 miles per hour. Someone talking on a cell phone, hands-free or not, is about four times more likely to be involved in an accident than someone who isn’t using a cell phone. That’s about the same risk level as a person who is driving drunk at a .08 blood alcohol level. Listening to the radio at normal volume levels doesn’t result in impairment. Neither does talking to a passenger. In fact, talking to a single adult passenger actually lowers the crash risk a bit. (David Teater, the senior director of Transportation Initiatives at the National Safety Council, makes this same point in another video.) Passengers will know to stop talking if the driving situation gets difficult, and can serve as a second set of eyes. People talking on cell phones tend to only look straight ahead, rather than also looking at things in their periphery by using their side mirrors and rear view mirror. While many U.S. states have restrictions on texting and driving, and some restrict talking on a handheld phone, it’s currently legal in all states for most drivers to talk on the phone hands-free. (Young drivers, novice drivers, and bus drivers are restricted in some states.) However, the studies show it’s a bad idea. For increased productivity with your work, avoid multitasking when you need focused attention. More importantly, avoid the types of multitasking that can create dangers for yourself and/or others. If you’re driving, pull off the road if you need to make a call or send a text message. 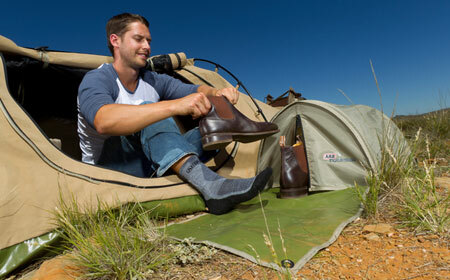 Now, I would assume that one’s tent or enormous 4X4 would also provide this kind of shoe storage … but, apparently not?? 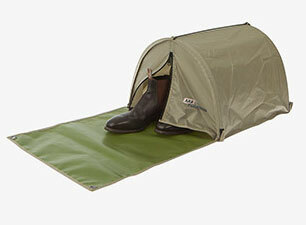 I’d also think a large zip-top bag could do the same thing and keep snakes and spiders (or whatever deadly critters roam the Outback) out of one’s boots (this does not, as the bottom flap doesn’t close). But, what do I know? I drive an all-wheel vehicle and the only “off roading” I’ve ever done is in a busy Target parking lot after a big snow. And the closest I’ve come to camping in the last two decades was in a cabin with central air. Thanks to reader Richelle for introducing us to this fun unitasker. When I worked as an IT director in the early 2000s, scanners were huge, bulky slabs of plastic and glass. They demanded a lot of desk space, cranky software, and patience. I thought of those olden days while I reviewed the ScanSnap iX100 this past week. 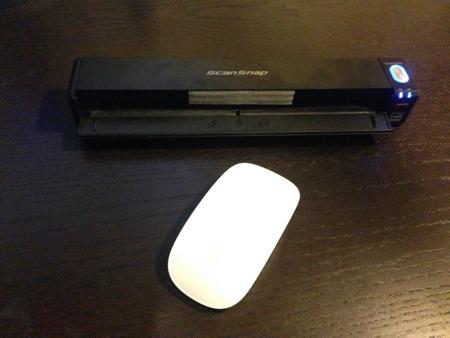 This small scanner (pictured above with my computer’s mouse for scale) is just under 11 inches long and about 1.5 inches tall. It’s very light — only 14oz — and completely wireless. But don’t let the size fool you, the iX100 is a very capable scanner. I scanned everything from documents to 8″x10″ photos to playing cards with ease. Finally, the lack of cables makes my clutter-averse heart happy. 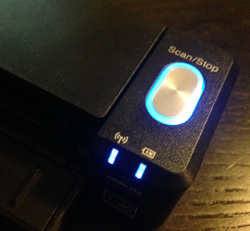 The following is a detailed look at the Fujitsu iX100 ScanSnap wireless scanner. I was happy to see the USB cable, as I’ve bought a few printers that shipped without one. The iX100 requires software to run, of course, and you’ve got two installation options. To get started, just insert the supplied DVD. From there you can install from the disc itself (the faster option), or download the lot from online. It’s a simple process and the installer walks you through the whole thing. When that’s done, you can connect the scanner to your computer via the supplied USB cable and turn it on by simply opening the feed guide (the little flap on front). My Mac recognized it instantly, which was great. That’s cool and all, but wireless setup is even better. The installer will ask if you want to enable wireless scanning. If you do, flip the Wi-Fi switch on the back of the machine so that the indicator light turns blue. The software will ask for permission to access your local network. Grant it and follow the instructions on the screen. When that’s done, you can put that USB cable right back in the box! Hooray! This entire process from opening the box to being ready to scan took less than 10 minutes. Easy setup doesn’t matter if the thing doesn’t work, right? Well I’m glad to say that it definitely does. There’s a tiny feature here that I really like. On the far left of the feed guide there’s a tiny arrow pointing to its edge. That little guy tells you how to orient documents, as well as where to place smaller items. If you’ve ever wasted time by scanning something upside down, you how nice that tiny arrow is. To scan a document, push it gently into the iX100 until you hear its motor give a tiny whirr. That tells you that it has hold of it. Next, decide if you want to scan in straight or “U-Turn” mode. If you decide on straight, it will spit your document out behind the scanner. If you decide on U-Turn mode, it won’t do that. To engage U-Turn mode, fold the top of the scanner’s case up. This directs the paper going through the scanner back toward the front. If you’ve got the scanner on the edge of your desk like I do, this is terrific, as you needn’t worry about anything falling to the floor or getting crumpled by an adjacent wall. Then tap the Scan/Stop button and the scan begins. Once the scan is complete, a menu pops up asking what you’d like to do with the scanned file. 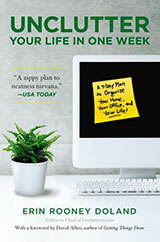 I was elated to see my beloved Evernote included. You can either send your file to Evernote as a document in the inbox or as a note. Other options include sending it to a specific folder, email, your printer, Dropbox, Google Documents, and more. This set of options is really nice, as chances are you aren’t going to simply drop the file onto your computer’s desktop, but do something with it once you’ve made the scan. There are even dedicated operations for organizing receipts and business cards in the software. This feature is super cool. Scanning to a mobile device lets to scan even if your computer is turned off or not around. Once wireless scanning has been set up, all you need to do is download the iX100 ScanSnap mobile application. It’s available for iOS, Android, and the Kindle Fire. I have an iPhone, so I tested the iOS app. Once the app has been installed, and both devices are on the same wireless network, just launch it on your smartphone or tablet. It will immediately begin looking for the scanner, and once it has found it, it asks for the device’s password, which appears on a sticker on the scanner’s underside. Now, all you’ve got to do is place a document into the scanner and hit the blue scan button in the app. The document is scanned and sent to the device. It worked just fine for me and it’s a super fast way to get a document into my phone and ready to share. When you’re ready to scan to the computer again, simply close the app. In conclusion, I’m quite impressed with the iX100. It’s very small and light, takes up almost no room, scans quickly and offers a wealth of options for working with your scanned document. Setup was a breeze and scanning directly to my iPhone is super useful. It is perfect for a small home office and for anyone who travels for business. Anyone looking for a clutter-free and simple scanning solution should definitely consider the iX100.